These Furniture Sliders Work Great! Easily Move Heavy Furniture on Hard Flooring! Dreading having to move that refrigerator? 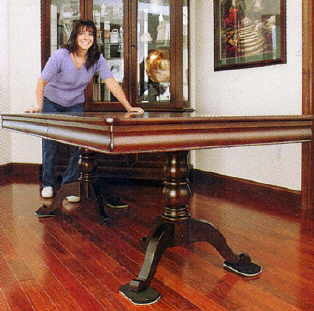 Have a large heavy table on your hardwood floors? Need to move that armoire or entertainment center, your sofa or other large piece of furniture and afraid you'll scratch the surface of your floor? No need to worry any longer! We got the perfect, heavy duty furniture sliders (furniture feet) for you that are perfect for moving heavy furniture or appliances over hard surface floors. I never go on a re-design appointment without taking several sets of the furniture sliders for on carpeting as well as hard floors. These are a life-saver when it comes to moving furniture and no one should be without at least one set (I have several, personally). If you're apt to move several pieces at one time, having more than one set is really handy. Just tilt the furniture forward or backward slightly, enough to push one of the sliders under each of the four corners. Then easily push your sofa, table, lounge chair, TV unit, armoire, refrigerator - whatever - to the new location. You hardly have to exert any effort. They are amazing! If you're by yourself, just tilt the piece of furniture forward or backward, then push one of the sliders under one corner with your foot. 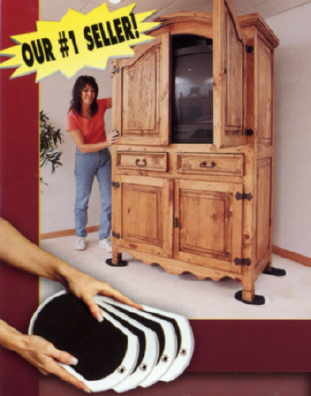 (Just be careful not to untilt the furniture while your foot is near the slider.) It's that simple. I can't tell you the number of times I've moved my furniture from room to room and back again all by myself since I've had these handy little sliders. No longer do I dread having to move my refrigerator so I can clean back of it or under it. With the hard surface sliders, the job is super easy. Keep your sliders handy any time you want to move something heavy, even if it's just for cleaning or adjusting positions. If you're thinking about or presenting in the interior redesign or home staging (staging homes, house fluffing, rearrangement business) business, then these furniture sliders are a must have! I never ever go to a redesign or staging appointment without 2-3 sets of sliders. The reason I take more than one set is so that I can move several pieces of furniture at one time without having to move the sliders any more than necessary. They are so inexpensive, investing in more than one set is a must for me. The felt on the bottom slides easily over the hard surface. It's softness protects the floor from scratches. The weight of the furniture or appliance is all that is needed to keep the sliders in place. Since the furniture or appliance slides so easily, with minimum exertion, you save your back from undue stress. If you've ever had a backache, you know how much these little guys help. The sliders come packaged 4 per set and measure 8" x 4-3/4". Your investment to protect your back is only $23 per set (4) plus shipping. 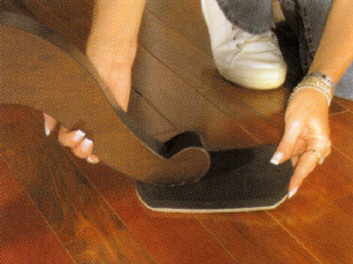 Good for most hard surfaces like hardwood floors, tile floors, vinyl floors. Used by homeowners, housekeepers, floor covering installers, painting contractors, janitorial services, carpet cleaners, interior redesigners and home stagers! Great for moving beds, sofas, entertainment centers, bookcases, desks, dressers, armoires, file cabinets, office furniture, appliances - you name it. If it's on a hard surface, you need these little guys! Purchasing is easy: Secure Shopping Cart/Tools of the Trade. Scroll down until you see the Furniture Sliders for Hard Floors. Moving heavy furniture on carpet? We've got that too! 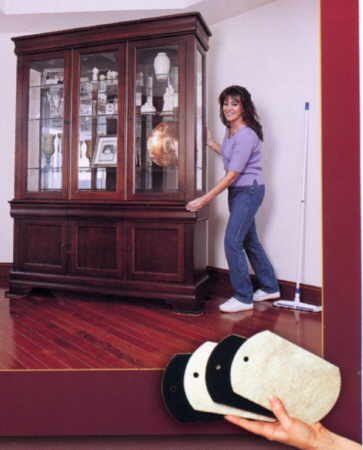 See our smooth sliders for moving furniture on your wall to wall carpeting. Imagine yourself totally independent, free to have fun while you work. Imagine the feeling of prestige when you describe what you do for a living. Imagine leaving a client's home after getting a hug for making their living room look spectacular. Imagine making $75-150 an hour for doing what you love. Imagine . . . Imagine being able to completely redecorate any room in your home in a day. Imagine your husband saying "Wow! This looks great! Where did you learn how to do this?" Imagine your children being proud to show off your home to their friends. Imagine walking into a high rise building, taking the elevator to the top suite, meeting the facilities directory and being hired to create an art program for the business. Imagine seeing the art you chose, framed and hanging in their suite of offices. Imagine the thrill of the employees seeing their workplace become beautiful and a more pleasant work environment. Imagine it! The next time someone asks you what you do for a living, imagine telling them you're a Corporate Art Consultant. 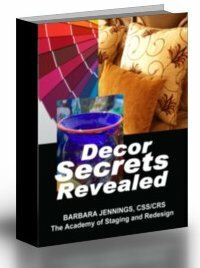 You'd love to receive periodic free decorating tips, discounts, notice of special sales, new product announcements sent to your email automatically ($147.00 value). You want a double opt-in newsletter that you can read at your leisure. You don't like spam, so you're concerned that your email address will be kept confidential. Confirmation Response is Required when notified by "ListManager" to do so. Be sure and whitelist our server at "decorating.listserve.us" so our newsletter doesn't get put in your spam mail logs. We hate spam too.